Termination earnings depend not only on the rate in the selected direction but also on business expenses. Expenses are borne on renting a room, purchasing equipment, purchasing new SIM-cards, and connecting high-speed Internet. Tariffs for Internet services differ from country to country. In some areas, Internet costs are very high, and sometimes even lead to losses. 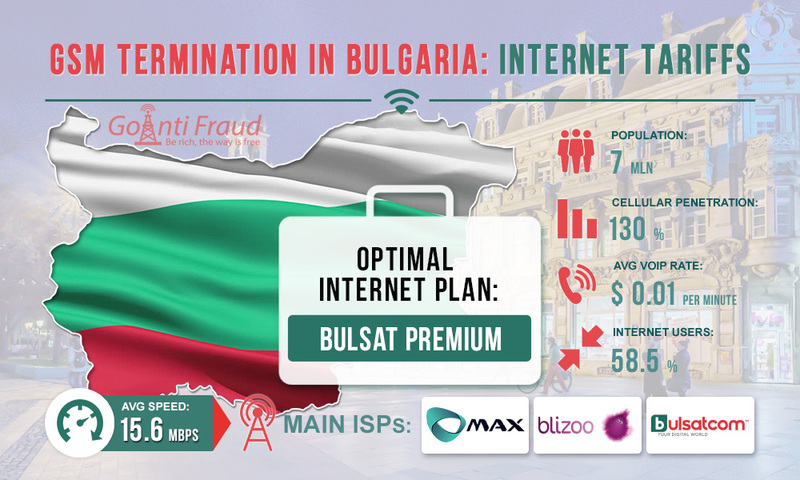 Let's consider, what tariffs on Internet packages are offered by providers in Bulgaria. Bulgaria is currently attractive for terminators since the telecommunications market, in particular, the mobile sector is well developed here. The penetration of cellular communication has reached 130%. At the same time, a favorable situation is observed in the Internet services market. Bulgaria provides a very fast Internet: it takes 20th place in the ranking of countries around the world in terms of speed. In this rating, it overtook such highly developed countries as Canada, Germany, and Australia. If you connect a VoIP gateway wifi router in Bulgaria, you can safely install multi-channel equipment. The three of listed above providers provide Internet access services using LTE (4G network) technology. It is better off terminating voice traffic via fiber-optic connections that provide a high-speed connection, with Bulsatcom providing such services. We advise you not to connect to Vivacom, an Internet provider and GSM operator. The fact is that cellular operators track terminators because their activities make telecommunications companies lose profits. In this case, anti-fraud systems can analyze not only voice traffic but also Internet traffic. When call termination is detected, traffic can be blocked by the provider. Start. The subscription fee is $7, the speed is up to 25 Mbps. Standart. The subscription fee is $7.57, the speed is up to 50 Mbps. Premium. The subscription fee is $8.74, the speed is up to 100 Mbps. Max. The subscription fee is $16.31, the speed is up to 200 Mbps. Extreme. The subscription fee is $57, the speed is up to 1,000 Mbps. The choice of the package depends on how many channels you use to work. The more traffic you terminate, the higher the speed of the Internet connection is. The optimal option is the Bulsat Premium package. You can use such Internet for the operation of multi-channel gateways, and at the same, time your business expenses for connection to the Global Network will be about $9 per month for one location. Remember that although Bulsatcom covers most of the territory of Bulgaria, it is better to place VoIP equipment in large cities as there is the highest data transfer rate.